The Rhinoceros is a massive mammal and there are equally massive wins up for grabs in the Raging Rhino slot machine from WMS. Based on the Black Rhino famous for roaming through the African and Asian wilderness, they are an endangered species due to poachers hunting them for their distinctive horns therefore many have been homed in animal sanctuaries and zoos to ensure they do not become extinct. When you click the bet amount button a popup displays offering various stakes for you to choose from with 23 in total, ranging from the lowest possible bet of 40p up to the maximum of £60 per spin. Combine this with the generous 95.91% return to player percentage and the fact you can enjoy up to 50 initial free spins and you have one incredibly rewarding online slot! Boasting bright colours and realistic designs, WMS have done a great job with the symbols in Raging Rhino, with a total of thirteen featuring on these wild reels! While you’d first assume that the Rhino would be one of the special symbols in Raging Rhino, it’s actually only a standard symbol, but there are two special symbols to be aware of. The first is the Wild which is a Serengeti tree at the forefront of a stunning bright sunset, and in the way online slots work most of the time, it substitutes for all but the Scatter symbol, though it is also important to note that it only appears on the second, third, fourth, and fifth reels. Speaking of the Scatter it is the shiny diamond that will remind you of the Double Diamond slot machine logo and this is actually titled ‘feature’ symbol and required for the free spins mode. On top of that there is of course the Raging Rhino with a fearsome look in his eyes with six on a payline being worth 12.5x your stake, a Gorilla, Cheetah, growling Alligator, Mongoose, plus standard low valued symbols of Ace to 10 – with the 9 and 10 symbols being equally lowest as six of either on a payline is only worth 2.5x your stake. In addition to these free spins not only can you retrigger for even more, you will also receive a Scatter win of up to 1,000x your stake plus each Wild symbol that appears in winning combinations are transformed into Wild 2x or 3x to further increase the amount you win – very nice indeed! 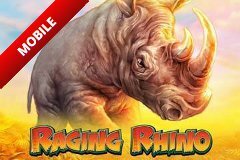 Get ready to storm the reels like a herd of Rhinos and take advantage of the massive wins that are up for grabs by playing the Raging Rhino slot machine at sites like Betsafe.com Casino and others that offer WMS slot machines. The design is beautiful with the animal symbols all having been designed in an ultra-realistic manner that will make you look twice to see if they are photographs or not. Add to this the generous staking options, the fact it contains 6 reels and 4,096 ways to win, ambient sounds from the wilderness, plus a free spins mode and you’d be crazy not to love it – although if you prefer bigger thrills check out prefer the Mega Moolah slot machine from Microgaming which also has an animal theme but boasts a life changing progressive jackpot. The fact you can achieve up to 50 initial free spins is enticing but you’ll find more often than not it’s 8 and 15 free spins, though thanks to the Wild multipliers that kick into action there are Rhino-sized wins up for grabs!